World 6- Airship is the fourteenth and final course of World 6 in Puzzle & Dragons: Super Mario Bros. Edition. It is an airship level with enemies consisting of Para-Beetles, Bullet Bills, Banzai Bills, Bob-ombs and a second boss fight with Roy Koopa. Clearing this course once unlocks Flying Squirrel Mario and Flying Squirrel Luigi as Leaders, and the Awaken spot at Toad Houses. This level starts with three battles, then a ? Block, four more battles (the fourth battle having a King Bill), and Roy Koopa for the boss fight (if the player already has Roy as an ally by clearing ★World 6- Airship, they fight Bullet Bill & Goombas instead). The player has all Orb types on the Orb field. ★World 6- Airship is a difficult version of World 6- Airship from ★World 6. 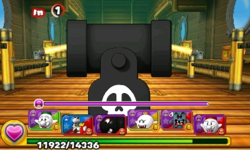 In the first battle, an additional Bullet Bill appears between the two Para-Beetles. The Orb configuration for this Special World course matches that of its normal world counterpart. Clearing this course unlocks Roy as an ally, and the final upgrade for the Lucky ? Blocks spot at Toad Houses. 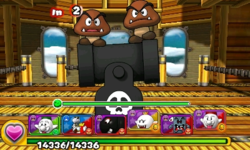 "Bullet Bill & Goombas", replacing Roy as the boss of World 6- Airship. This page was last edited on October 6, 2017, at 15:45.